Visiting Macau tower is a must do activity when in Macau. It is the highest point in Macau and #19 in the list of world's tallest towers. 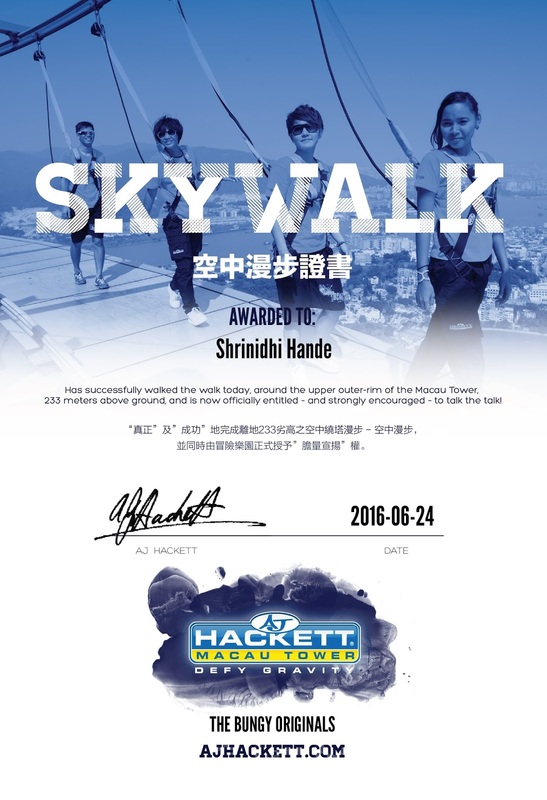 While most towers just offer a view point and restaurant on top, Macau tower offers different adventures, operated by AJ Hackett. When we went to Macau tower, we evaluated various adventures and activities on offer. Bungee jump was tempting but at about INR 30K per person for cheapest option (doesn't include photos n videos and GoPro video) it was slightly beyond my budget and had to decide against it. I have done skydiving at 30k, was hoping bungee jump to be bit cheaper. But at 233 meters, Macau tower offers one of the highest bungee jumps (#2 in the world), thus commands a premium. Other option was tower climb- climbing to top of the tower for a fee close to 19k INR. The cheapest was the Skywalk, which would cost close to Rs 7000 per person, including tower entrance, T shirt and photos on pen drive. Thus had to be content with Skywalk. While list price is 848 MOP, we were offered some 10% discount as we took some time to evaluate our options. Upon reaching level 61 (Adventure deck) the staff verified our ticket and gave us an orange T shirt, which is meant for skywalkers. (Bungee jumpers got brown-red T shirt). We had to keep our stuff in the locker- which costed additional 30 MOP (Close to 260-270 Rs). I requested them to let me use my GoPro along with either head mount or wrist mount- this request was summarily rejected. Adventure operators always want you to buy videos from them, not make your own videos. Next few activities involved posing in different positions-one leg and one arm out of the edge (first pic, both arms out, sitting on the edge etc. We could also witness couple of bungee jumpers diving down. These activities help you overcome your fear. The harness will ensure we never fall of, so we should gather enough courage to go to the edge and perform the stunts as demonstrated. The activities lasted for about 30 minutes. We did one circle on the outer ring of the tower. Wind was moderate and view was great. Missed my cameras. Once back inside the tower, I took some photos of next batch. We got a USB drive with our pics within 10 minutes of coming back. We also got a discount card- for subsequent walks we are entitled to 25% discount and if we pay for 2 more walks, 4th will be free. An e-certificate was emailed to us later in the day. After roaming around for a while in level 61, we came down to level 56, which is general observation deck. Clicked lots of photos of Macau town- both day light and night. Those photos command a separate post. Above: How to throw some light on top of Macau tower! This is scary but you can do it. Only you! Hats off! Not just me- 100s of people do this every day. Even you can. @Ami: :) It is a good venue for next #Flipkartoutdoors meet!